The level of inbreeding among Germany’s endangered Black Forest Draught Horses is increasing and may have an effect on foaling rates, according to researchers. The coldblood breed originates from the area of the Black Forest in South Germany. It is still bred mainly in the area of the Black Forest, in the Baden-Wuerttemberg region. The predominant coat colour is dark chestnut with a light mane. Anecdotically, these horses are believed to be descendants of the “Wälderpferd”, a local horse breed kept by farmers in the Black Forest. Several other horse breeds have influenced the Black Forest breed in recent centuries. A studbook was established as early as 1896. Genealogically, the Black Forest horse belongs to the Noric Horse group. Like many draught horse breeds, increasing mechanization in agriculture caused their numbers to plummet. In the 1950s, the breed’s population fell to only 159 mares and only two stallion lines. From the 1970s, five new stallion lines were added to broaden the genetic diversity – a move that prevented further erosion of the population. In 2013, 979 mares and 79 stallions were registered. Nevertheless, it is still considered an endangered breed. Researchers Maarit Müller-Unterberg, Sandra Wallmann and Ottmar Distl, from the Institute for Animal Breeding and Genetics at the University of Veterinary Medicine Hannover, set out to explore the effects of inbreeding and other systematic effects on fertility within the breed. The trio, in their retrospective study, examined the influence of the inbreeding coefficient on foaling rates using records from the 2001-2009 breeding seasons. It included all coverings reported for 1024 Black Forest mares by 32 stallions from the State Stud Marbach. Data from 4534 estrus cycles were used to calculate the per-cycle foaling rate (CFR). The trio, writing in the journal Acta Veterinaria Scandinavia, said the results showed that the mating type, stallion line of the mare, sire, age and reproductive status of the mare exerted the largest influences on the CFR in the breed. A total of 1852 foals were born alive between 2001 and 2009, resulting in an overall foaling rate per season of 61.46% and a CFR of 40.85%. The average inbreeding coefficient was 7.46% in mares, 7.70% in stallions and 9.66% in expected foals. The average inbreeding coefficient per year steadily increased from 2001 to 2008, with maximum values at 7.93% in mares, 8.13% in stallions and 10.32% in expected foals. In 2009, a slight decrease of inbreeding coefficients was seen in all three groups. The average CFR across all breeding seasons was 40.9%. The average of CFR for individual stallions ranged from 29.7 to 56.3%, which pointed to large differences in stallion fertility. “Due to the small population size of the Black Forest Draught Horse, the level of inbreeding is increasing and may have an effect on foaling rates,” the trio said. Increasing inbreeding coefficients in mares and expected foals were related with a slight tendency toward decreasing CFR, they reported. 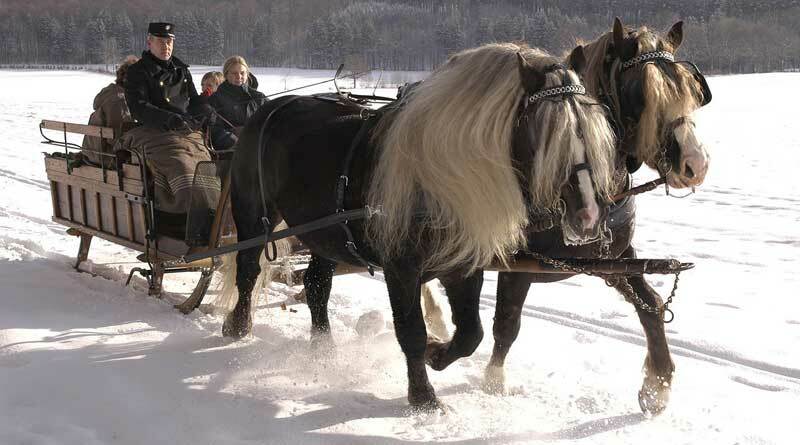 “Control of inbreeding in Black Forest Draught Horses is necessary to avoid negative effects on fertility in further generations,” they concluded.